Tea and Talk for Two: Which palette? Which colors? Which brushes? 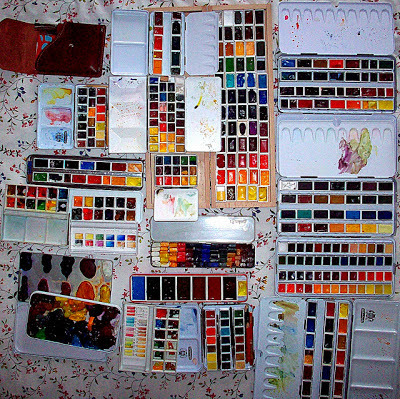 Yes, it's her collection of watercolor paint palettes. I was amazed (and stunned) when I saw it ... like we used to be at those pictures of stacks of filofax binders in all colors and sizes. But of course I had to look closer at all of the different palettes -- what sizes, configurations they are. Because the questions of what palette to use, what assortment of paints (wet or pan? What brand? ), what colors, is as engrossing and instructive as are the personalize-your-planner entries I know you love. 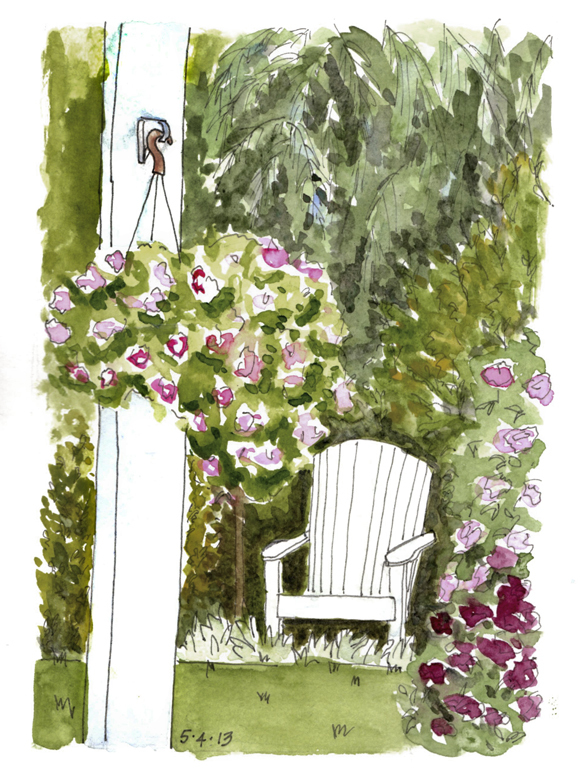 And you will not be surprised to know that there are people posting videos to show what they keep in their sketch kits, as Carole does here. There are probably tons on Youtube but I haven't ventured to look yet. My head is swirling with enough as it is. I find it endlessly fascinating. The visual delight of all that color, for one thing. Looking at how people arrange things, and come up with clever solutions for little problems, and sort their colors... It is artistic voyeurism and education all at once. I think I told you I'm trying to do a painting every day in connection with a Facebook group called Every Day In May , and yesterday's topic was a pine tree. I set out to focus on the cedar tree in the corner of the backyard with the chair in its shade, and the flowers sort of carried me away.